How heavy is a Kilo? The Cylinder has been the standard reference for the weight of a Kilo since 1889 (since when all the clever people in the world have not come up with a better way od measuring it. Anyway, the other problem is that people keep picking it up, and every time someone does, it gets a little bit lighter…. and that, I’m afraid to say, is making you and me and everyone else a little heavier. 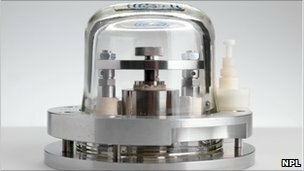 Or as Richard Steiner has been quoted as saying “if somebody sneezed on that kilogram, all the weights in the world would be instantly wrong”. Now you know. More here and here.